The Rev. Eddie Kelemeni and the Rev. Amy Wake stand in the award-winning sanctuary at First United Methodist Church. 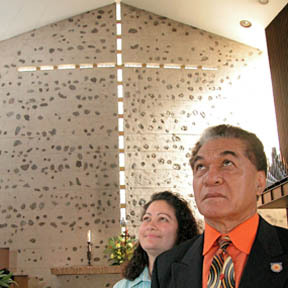 The 30-foot cross of translucent glass brick behind the altar is not a decoration, but part of the load-bearing wall, symbolic of the foundation of Christianity.